One hundred years ago today, on the 4th of August 1914 the whole of Europe was plunged in to what would become known as ‘The Great War’. During the next four years all countries around the world would be sucked in, one way or another, in to a war that many claim was unnecessary and without purpose. The ‘timebomb’ leading up to the declaration of war started on the 28th June 1914 with the assassination of Archduke Franz Ferdinand and his wife, Sophie, who were shot in their carriage while on the streets of Sarajevo during a short diplomatic visit. The assassin was Gavrilo Princip, a Bosnian Serb who was a Yugoslav nationalist who wanted his country to be free from the reign of Austria. What followed was weeks of negotiation which eventually fell to the wayside when Germany attacked Luxembourg on the 2nd August 1914 and then declared war on France the next day. Belgium, who wanted to stay neutral, refused to allow Germany to cross their borders to get to France. This resulted in Germany declaring war on Belgium. On the 4th August Britain declared war on Germany. So was to begin the bloodiest war in known history. 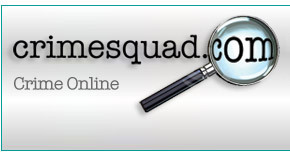 Tens of millions of soldiers from around the globe were involved in the crisis. There have been many documentaries about the savage treatment of the soldiers in those damp, dark trenches, sharing their small space with the rats that nibbled at the dead – and those still alive. Due to this and the squalor, disease was rife. Living in such horrendous conditions meant many soldiers could not cope with the pressure of being a soldier. These days we cannot begin to imagine the horror of living a normal life and then be transported to live in filthy trenches, not knowing when you were going to be sent ‘over the top’, living with the constant fear that today could be your last day, when you have seen friends and family members killed in front of your eyes. It doesn’t bear thinking about – but bear it we must as it would be a travesty for these young boys and men to ever be forgotten, or to forget the lessons learned. Without glorifying this war, there have been several significant novels within the crime fiction genre which have highlighted this war. One of the most famous situations during the Great War was ‘The Battle of the Somme’. 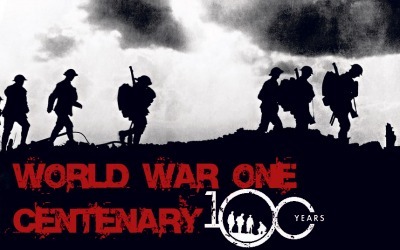 On the first day alone nearly twenty thousand soldiers were killed on both sides. 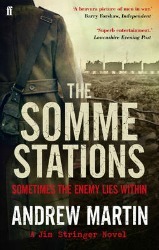 Andrew Martin’s novel, ‘The Somme Stations’ which won the CWA Ellis Peters Historical Dagger in 2011, sends his protagonist to the front. As with all the Jim Stringer novels, being a railwayman, these mysteries involve some form of locomotion. Needless to say, you don’t need to be train buff to enjoy Martin’s books. 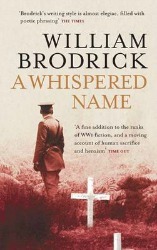 Another that has been written recently and enjoyed great success is ‘A Whispered Name’ by William Brodrick. This is a savagely sad case about desertion. As is the same around the world, you learn from your mistakes. A hundred years ago any deserter was akin to Judas, or even worse, one of Kaiser Wilhelm’s own soldiers. Desertion was normally dealt with by firing squad. 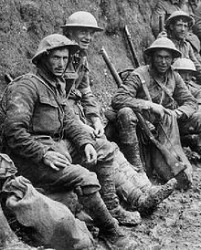 Those men and boys who were swept along by the macho world of being a soldier quickly learned the harsh, stark reality of life in the trenches. Mentally some could not cope. Thankfully, in recent years those soldiers have been pardoned and their names are no longer attached to any shame. This issue is dealt with subtlety in Brodrick’s novel. One day, whilst out amongst the gravestones and the bee hives, Father Anselm meets a young woman and an elderly gentleman, the latter who is extremely distressed. They ask for Father Herbert, one of the founders of the Priory. It is a shock for Anselm to hear someone suggest that Herbert’s silence was as good as a lie. Soon he begins to search the early life of Father Herbert and finds himself immersed in 1917, during the terrible slaughter of the Passchendaele and the desertion of a soldier. The title comes from the Siegfried Sassoon poem, ‘How To Die’ and is a very moving and humane novel with a mystery wrapped within its heart. ‘A Whispered Name’ deservedly won the CWA Gold Dagger for Best Crime Novel in 2008 and is a potent reminder of what those soldiers went through to give us freedom. As with the Second World War, the unnecessary bloodshed, the Machiavellian subterfuge, the stalemate between the warring factors is ripe for fiction and this isn’t a bad thing. I have only highlighted two authors here but there are many who have transported their reader to this monumental time in history. As long as the Great War can be written about, the less likely are we ever to allow the sacrifice these soldiers made to slip away in the mists of time. As the saying goes: ‘Lest we forget’ and we never should.